Leave honey for winter food. "Everything works if you let it"
In the past few years I've changed most of how I keep bees. Most of it was to make it less work. 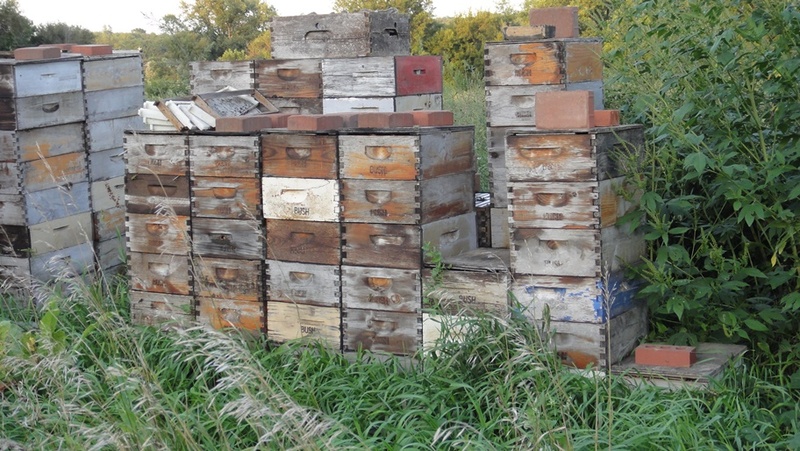 I'm now keeping about two hundred hives with about the same work I used to put into four. So maybe I should clarify, that I'm not talking about not working hard. I'm just talking about accomplishing more for the same amount of work. To put it in modern terms, I believe to succeed you need to work smarter and harder. Here are some of the things I've changed. I never have to worry about the bees not having access to the hive because the grass grew too tall. I also don't have to cut the grass in front of the hives. Less work for me. I never have to worry about the bees not having access because of the snow being too deep (unless it gets over the tops of the hives). So I don't have to shovel snow after a snowstorm to open the entrances up. I never have to worry about putting mouse guards on or mice getting into the hive. I never have to worry about skunks or opossums eating the bees. Combined with a SBB I have very good ventilation in the summer. I can save money buying (or making) simple migratory style covers. Most of mine are just a piece of plywood with shingle shims for spacers. But some are wider notches in inner covers that I already had. In the winter I don't have to worry about dead bees clogging the bottom entrance. I can put the hive eight inches lower (because I don't have to worry about mice and skunks) and that makes it easier to put that top super on and get it off when it's full. Lower hives blow over less in the wind. This works nicely for long top bar hives when I put supers on because the bees have to go in the super to get in. With some Styrofoam on the top, there's not much condensation with a top entrance in the winter. Just remember, if you have no bottom entrance and you use an excluder (which I don't) you will need some kind of drone escape on the bottom for them to get out. A 3/8" (9.5mm) hole will do. I would put it in the entrance block on the bottom board. The frame is the basic element of a modern bee hive. Even if you have various sized boxes (as far as the number of frames they hold) if the frames are all the same depth you can put them in any of your boxes. You can put brood up a box to "bait" the bees up. This is useful without an excluder (I don't use excluders) but it's especially useful if you really want to use an excluder. A couple of frames of brood above the excluder (leaving the queen and the rest of the brood below) really motivates the bees to cross the excluder and start working the next box above it. You can put honey combs in for food wherever you need it. I like this for making sure nucs don't starve without the robbing that feeding often starts, or bulking up the stores of a light hive in the fall. You can unclog a brood nest by moving pollen or honey up a box or even a few frames of brood up a box to make room in the brood nest to prevent swarming. If you don't have all the same size, where will you put these frames? You can run an unlimited brood nest with no excluder and if there is brood anywhere you can move it anywhere else. You're not stuck with a bunch of brood in a medium that you can't move down to your deep brood chamber. The advantage of the unlimited brood nest is the queen isn't limited to one or two brood boxes, but can be laying in three or four. Probably not four deeps, but probably in four mediums. All of these weights get exaggerated because the box, even though you have broken it loose is still somewhat glued to the box below so you are often lifting two boxes until the bottom one lets go. If you want a grasp of these and don't have a hive yet, go to the hardware store and pick up a fifty pound boxes of nails or, at the feed store, two fifty pound bags of feed. A ten frame deep will weigh half again this much. An eight frame medium will weigh less than this much. I find I can lift about fifty pounds pretty well, but more is usually a strain that leaves me hurting the next few days. The most versatile size frame is a medium and a box of them that weighs about 50 pounds is an eight frame. So, first I converted all my deeps into mediums. It was a huge improvement over the occasional deep full of honey I had to lift. I still got tired of lifting 60 pound boxes, so I cut the ten frame mediums down to eight frame mediums. I'm really liking them. They are a comfortable weight to lift all day long and not be in pain for the next week. Any lighter and I might be tempted to try to lift two. Any heavier and I'm wishing it was a shade lighter. I'm wondering how many aging beekeepers have been forced to give up bees because they hurt themselves lifting deeps and it hasn't occurred to them there are other choices? "...no man's back is unbreakable and even beekeepers grow older. When full, a mere shallow super is heavy, weighing forty pounds or more. Deep supers, when filled, are ponderous beyond practical limit." I often get asked what the down side of using all eight frame mediums is. There is only one I know of. 100 hives * $224 = $22,400 which should just about cover your back surgery. Typically I hear the question, "do they winter as well?" and I say they winter better in my experience as the cluster fits the box better and they don't leave behind frames of honey on the outside as much as they do in the ten frame hives. To take not lifting to the next level, how about a hive that's all on one level? I currently have nine horizontal hives and they have done well. There are some slight adjustments to how to manage them, but the principles are the same. You just can't juggle boxes around. Only frames. But then you can put super on a long hive if you like. I inherited a few deeps and I already had a Dadant deep, so I currently have three horizontal deeps (9 5/8"), one horizontal Dadant Deep (11 5/8"), four horizontal mediums and one Kenya top bar hive. I wonder how many old beekeepers, who are being forced to give up their bees, could keep a couple of these without hurting themselves and without much stress? I wonder how many commercial beekeepers could minimize the labor involved in their operation with these? I wonder how many hobbyists could just make their life easier with less lifting? You can just break out the wedge on a top bar, turn it sideways and glue and nail it on to make a guide. Or put Popsicle sticks or paint sticks in the groove. Or just cut out the old comb in a drawn wax comb and leave a row at the top or all the way around. You can cut a triangle off of the corner of a ¾" board and have a triangle that on its broad side is 1 1/16". Or buy some chamfer molding and cut it to length. This can be nailed and glued to the bottom of a top bar to make a peak that the bees will attach to. Once you've made these frames you won't need to put starter strips or foundation in them. Or you can just cut a 45 on each side of a top bar before you put the frame together. Also you can put empty frames with no guides between drawn combs and you can put frames with a top row of cells left on the top bar in anywhere you'd put a frame of foundation. How much time do you spend putting in foundation, wiring it, tearing it out because it sagged and crumpled or fell out of the frame? I don't do much of that lately. I mostly use foundationless instead. And that's not even taking into account the cost of foundation, let alone small cell foundation. It saves me a lot of work. Yes, I extract them. I can also use them for cut comb. No, I don't wire them but you can if you like. Going to no chemicals saves a lot of work and trouble. All the frames are "clean" so you don't have to worry about residue. If you only feed honey, it's all honey and you don't have to worry what might be syrup instead. You can harvest honey from where ever you find it. And of course you don't have to put in (and pull out) strips, mix up Fumidil syrup and dust with Terramycin, treat with menthol, make grease patties, fog with FGMO, make up cords, evaporate Oxalic acid. Just think of all the spare time you'll have. And how clean your honey will be. Of course, I've found natural cell size a prerequisite at least for dropping the Varroa mite treatments. Instead of feeding, just leave them enough. You don't have to harvest it. You don't have to extract it. You don't have to make syrup. You don't have to feed them for winter. Of course you get this with foundationless frames, but the "side effect" (or the effect if it's what you were looking for) is not only the labor you save wiring wax or buying and inserting foundation, but once the Varroa mites are under control and your mite counts have stayed stable for a couple of years, you might even be able to forget about Varroa. It is very nice to be back to just worrying about the bees instead of the mites. Carts have really helped me with my back. My main yard is across the pasture from my house. Moving boxes, both full and empty, back and forth is a lot of work. It's hardly worth loading the boxes in my van to drive around the long way to get to the hives or visa versa. But it's a long carry. I bought three carts and have used all of them to advantage. I mostly use the Mann Lake one right now. I modified both the Mann Lake and Brushy Mt. ones a bit because the boxes would rattle off the cart on the way over to the hives and the Mann Lake one was a little too far off the ground, so I moved the axle up to lower the arms. The Brushy Mt one needed a rack (so they wouldn't rattle off) and a bolt for a stop so I can wheel it around empty. Here's another labor saver. How about not even building frames? Or put in foundation. Just top bars? One big long box instead of three separate ones? All the advantages of a horizontal hive. Plus calmer bees because you only face a frame or two of them at a time instead of exposing ten frames of them simultaneously. Leave the burr comb between boxes. Here's one I think helps the bees, gives you a chance to monitor for mites on drone pupae and saves work. Leave the burr comb that goes from the bottom of one frame to the top of the one below it. Yes it will break when you separate the boxes, but it makes a nice ladder for the queen to get from one box to the next. Also, they often build some drone comb between the boxes and if you tear them open you'll see the drone pupae and maybe you'll notice mites (you should be looking). Stop cutting out swarm cells. I read the books and I tried to do this when I was young, inexperienced and foolish. The bees soon taught me what a waste of time and effort it was. If the bees have made up their mind to swarm, do a split or put each frame with some swarm cells in a nuc with a frame of honey and get some nice queens. Once they've gone this far, I've never seen them change their mind. Of course the solution was to keep it from getting this far. Keeping the brood nest open while keeping enough expansion room in the supers is the best swarm control I've found. If the brood nest is getting filled with honey, put a couple of empty frames in. Yes, empty. No foundation, nothing. Try it. The bees will build some drone comb, probably the first frame, but after that they'll draw some very nice worker brood and the queen will have it laid up before the whole comb is even drawn or even full depth. You'll be shocked how quickly they can do this and how it distracts them from swarming. I don't know how often I see questions on bee forums asking how can I make the bees do this or that. Well, you can't make them do anything. In the end they do what bees do no matter what you try to make them do. You can help them out, by making sure they have the resources they need to do what you think they need to do and by manipulating the hive so they don't swarm. You can fool them into making queens and such. But you'll have a lot more fun and work a lot less if you stop trying to make them do anything. I suppose this also includes all the worrying about winter and trying to give them heaters and such. The bees have lived for millions of years with no heaters and no help. If you make sure they are strong and have enough food and adequate ventilation so they don't end up in an icicle, then you should relax. Work on your equipment and see them in the spring, or at the earliest, late winter. Stop scraping all the propolis off of everything. Doesn't it feel like a losing battle anyway? The bees will just replace it, so unless it's directly in your way, why bother? You've probably noticed by now, if you looked at pictures of my hives, that a lot of them are not painted. Maybe the neighbors or the wife will complain but the bees won't care. They might not last as long. I don't know because I only stopped painting them about four years ago. But think of all the time you'll save! Lately I bought a lot of equipment and wanted to keep it as nice as I could for as long as I could so I started dipping them in beeswax and gum rosin. "Some beekeepers, trusting the ways of bees less than I do, at this point routinely 'switch hive bodies,' that is, switch the positions of the two stories of each hive, thinking that this will induce the queen to increase her egg laying and distribute it more widely through the hive. I doubt, however, that any such result is accomplished, and in any case I have long since found that such planning is best left to the bees." Don't look for the queen. Don't look for the queen unless you have to. It's one of the most time consuming operations. Instead look for eggs or open brood. Nothing wrong with keeping your eye out for her, but trying to find her is time consuming. This even works for things like setting up mating nucs. If you break up a hive for mating nucs and don't look for the queen on the frames and give to the nucs you may lose a queen, but you'll save a lot of time. She'll just get superseded. The only real advantage to finding the queen often is the practice but this could be more easily done with an observation hive. There are many operations where people, including me, will tell you to remove the queen and wait until the next day. This would be things like introducing queen cells to nucs or introducing a new queen to a hive. Waiting will improve the odds of acceptance, But reality is it will only improve it a little. So if you want to save time, don't wait until the next day unless you have to, do it now while you have the hive open. No, they won't take it as well, but if you have to feed it will keep them from starving and you won't have to make syrup and you won't have to buy feeders and you won't have any drowned bees. One of the upsides of smaller boxes is that you can manage the hives "by the box" rather than "by the frame". Heddon was one of the first proponents of this style of management and it was one of the selling points of his hive "back in the day." If you run all eight frame mediums and you've got a booming hive you want to split in the spring, don't look for the queen, don't look for brood, just split it by the box. Even with deeps a booming hive that has the bottom two boxes seriously occupied by bees probably has brood in both of them. Of course success is mostly dependent on being able to guess pretty accurately that you have brood and stores in both boxes. If you're wrong, you'll end up with one box empty after only a day or so. But if you are right, you've saved a lot of work. With eight frame mediums (which are half the volume of a ten frame deep) the odds of this working on a hive that is at least four boxes (the equivalent of two ten frame deeps) is twice as good. By going every other box you maximize the odds of getting brood and stores in both resulting colonies. You just deal the boxes like cards. Put a bottom board on each side and do "one for you and one for you" until you're done. Then add two empty boxes (full of frames of course and drawn comb if you have it...) on top. Come back in a month and see how they are doing. A bit more detail. If I have eight frame mediums (which I do) and four boxes are full of bees and honey, it's a sure thing there is brood in the bottom three boxes and honey in the top two (yes that makes five, but the 2nd from the top will be a mixture and the top one is probably just honey, but might have some brood). This means I can split by the box and distribute the resources fairly evenly. With two ten frame deeps it is a much more iffy proposition. The top box is probably mostly honey and the bottom mostly brood so the resources are not evenly distributed at all and the top box might be all honey in which case they would be hoplessly queenless. With some practice, you migt be able to distinguish the likely hood by the number of bees and the weight of each box, but all in all, I'd stick with doing it with eight frame mediums where the distribution will be more even when you "deal" the boxes. Anything less than four eight frame mediums, in my experience, is not really strong enough to split and expect it to build quickly. If you make weak splits they languish before they finally get going. If you make strong splits they don't usually miss a beat. The queenless half goes to gathering the flow while they raise a new queen, and the queenright half continues to build a population. The bees are not idle in either case so things build up reasonably quickly. A weak split, though, will be struggling to make ends meet. A colony is an ecomony. It has to meet it's overhead before it can really prosper. If you make a strong split it can continue to prosper. If you make a weak split it has to struggle it's way back up to breaking even before it can prosper. The only real risk when doing this with four boxes of bees in eight frame mediums is if you are into the time of year that they may have swarmed. Then if you don't make sure they have some brood to rear queen from, they could end up queenless if they swarmed already and the virgin queen has killed all the queen cells and there are no appropriately aged larvae from which to rear a queen. The ideal time for a walk away split is two weeks before the main flow, assuming they have not swarmed yet. It will have the least impact on the honey crop and the queen will be well fed and well bred. If you let the bees requeen themselves you'll breed bees that can and do requeen themselves. Bees in nature have this selective pressure on them. Bees that are constantly requeened by the beekeeper do not have this selective pressure on them. I would only requeen if the hive seems to be failing and I would do so from a hive that is successful at requeening themselves. Along with this, of course, stop buying queens. Make splits and let the bees raise their own. That way you get bees that are well adapted to your climate and your pests and your diseases. and you get diseases and pests that are well adapted to coexist with the bees instead of killing them.